Official figures show that around 51,400 people came out for the Acte 13 gilets jaunes protests this weekend, with major incidents in Paris including one protester who had a hand “torn off”. Figures from the ministry for the Interior show a slight drop in protesters this week - the 13th consecutive week - down from 58,600 the week before, and said that there were 4,000 protesters in Paris on Saturday February 9, compared to 10,500 one week earlier. Yet, some figures - including from the Agence France-Presse - suggest the numbers in Paris were closer to 13,800. 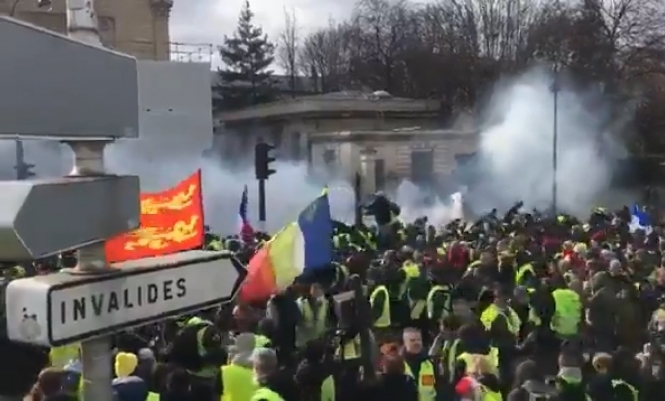 Tensions mounted in the capital, especially as protesters arrived in front of the Assemblée Nationale building. One male protester is reported to have had at least “four fingers torn off” during the disorder, with the exact circumstances around the incident still unclear. Early reports suggest that it happened as protesters clashed with law enforcement, who threw “grenades” designed to dispel crowds as people tried to breach the barriers outside. The man, who has been described as a “gilets jaunes photographer”, reportedly used his hand to try to push away the grenade from his leg, and was injured as the weapon went off. Medics and witnesses at the scene confirmed the injury, with some saying the man had “nothing much left under his wrist”. The #YellowVests protesters set fire to a Porsche in Paris. Some shops, banks, ATMs, and luxury cars were smashed and burned near the Eiffel Tower. A car from anti-terrorist military unit, Sentinelle, was also burnt out, prompting Interior minister Christophe Castaner to express his “indignation and disgust” and denounce the attacks as “intolerable”. By early evening, 36 people had been arrested in Paris, with police responding with tear gas to protesters throwing projectiles. Protests and clashes with police also took place in Lyon and Toulouse, as well as in Bordeaux, where police used water cannon to dispel crowds.